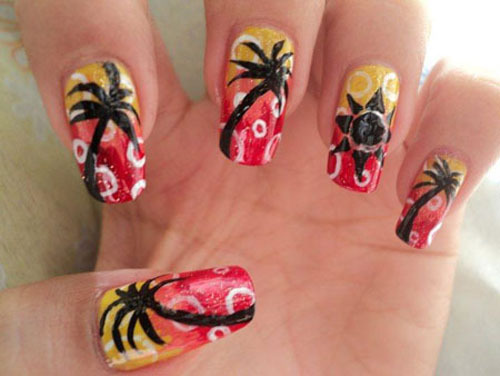 Palm tree designs are one of the most popular and easy to create designs for nail arts. When it comes to free hand nail art designs, this is one design which one can create very easily without any professional hand in nail art or good hands in painting. Palm trees are a very easy to create design. 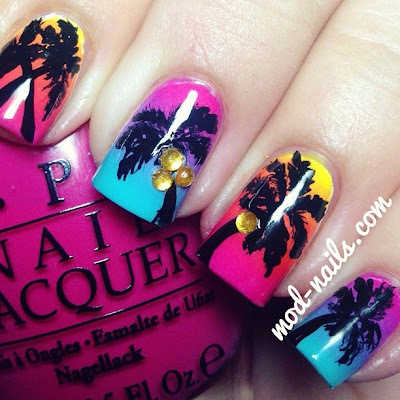 You can sport different forms of silhouette palm tree designs on the nails for different occasions. Imagine the setting sun and the beautiful sky set in purple ad orange at a distance. 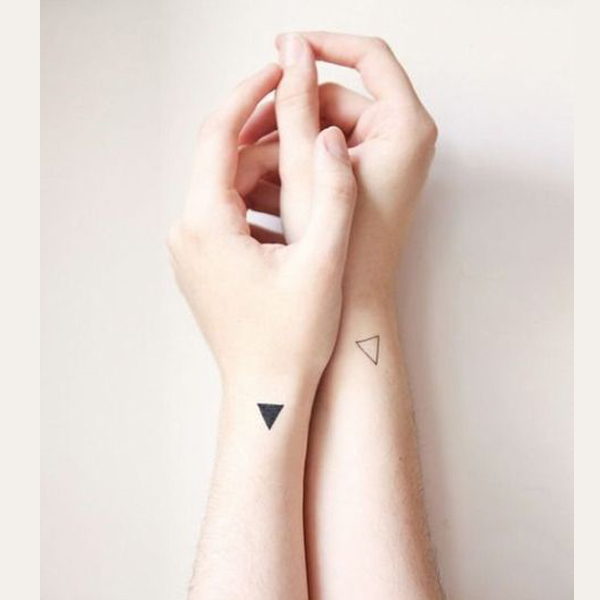 If you can perfectly imagine this then you can easily create the design shown above. You can add those golden sand beaches too at the foot of the palm trees with a glitter polish of your choice or loose glitters set in transparent polish. Use a fan brush for this. This kind of a multi coloured abstract nail art can be created with the use of various colours of nail polishes in horizontal order. Make some easy striped lines for the demarcations with you black striper or nail art brush and black polish. 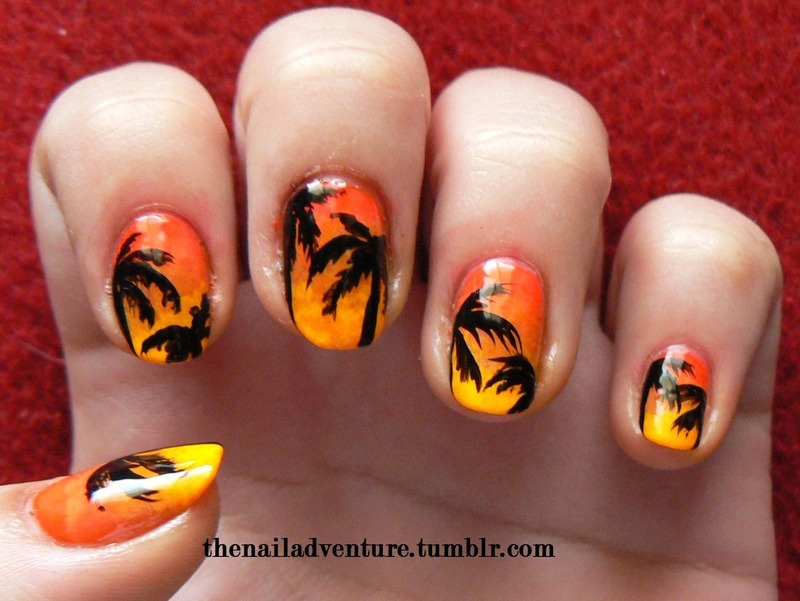 Finish off by drawing the design of palm trees over the design so created. Cool looking isn’t it? Try out a gradient texturing nail art with dark and light blue and some yellow. Use a sponge for the texturizing. 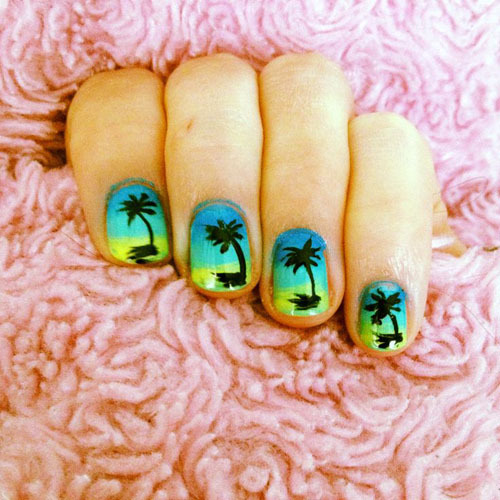 Finish off by drawing a beautiful palm tree on to each of your nails. Use a transparent polish to seal in the design so created. 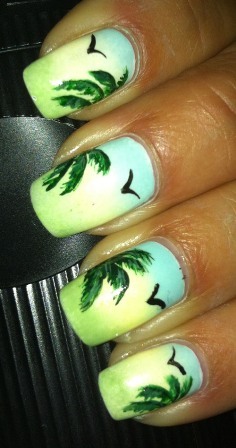 A clear day palm tree and beach nail art can be created with some free hand hard work. Use your dotting tools for drawing the clouds or use your toothpicks for the design. 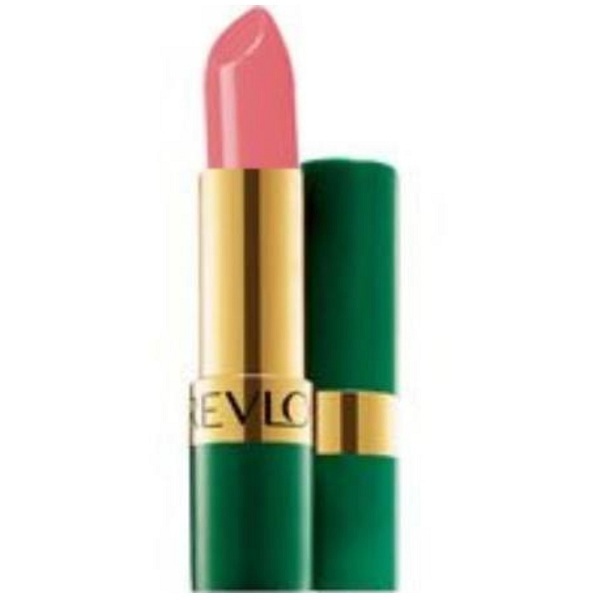 You can use two shades of green and a brown polish or paint and your nail art brush for the palm frees. 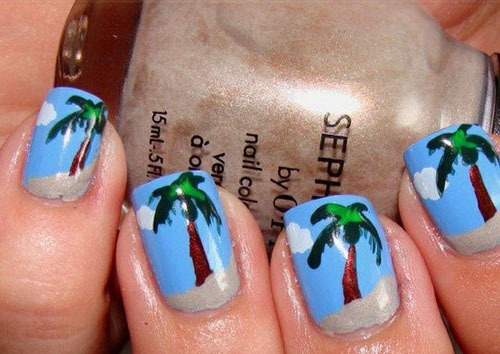 Make sure that the palm trees has colours because this s a day time scene that you are painting on your nails. 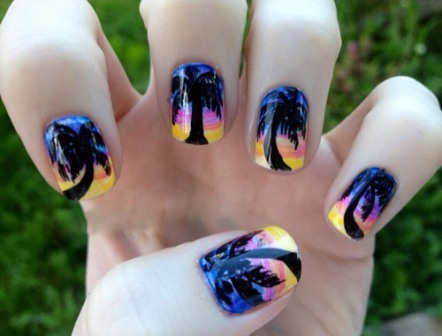 This is a multicoloured gradient palm tree nail art. You can easily create this with different colour polishes and sponge. Try out this design. A gradient textured sunset and palm tree nail art created beautifully by the choice of various colours used in it. Do not forget the transparent polish for the shine and gloss effect. This design is a bit different than the others since you will have to use either stencils and airbrush material for the circular patterns on the nails or use the end of a straw and white polish. After the base is properly created, draw the palm trees in black for the silhouette effect. Instead of drawing whole palm trees, you can draw some sectioned tree patterns on your nails and some birds. Give the base paint in gradient using 2-3 colours and sponge. 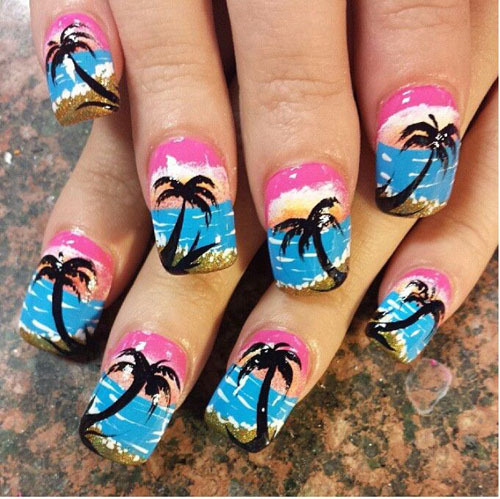 This kind of an awesome looking silhouette palm tree design can be created for those days when you wish to spend your summer vacations on the beach. If you have good hands in drawing and some basic colour texturizing skills then you can easily create this kind of nail art. 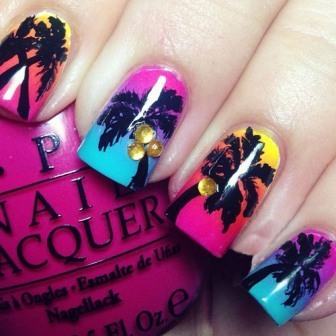 Did you love the palm tree nail art designs just as much as we did? Leave your feedback below. 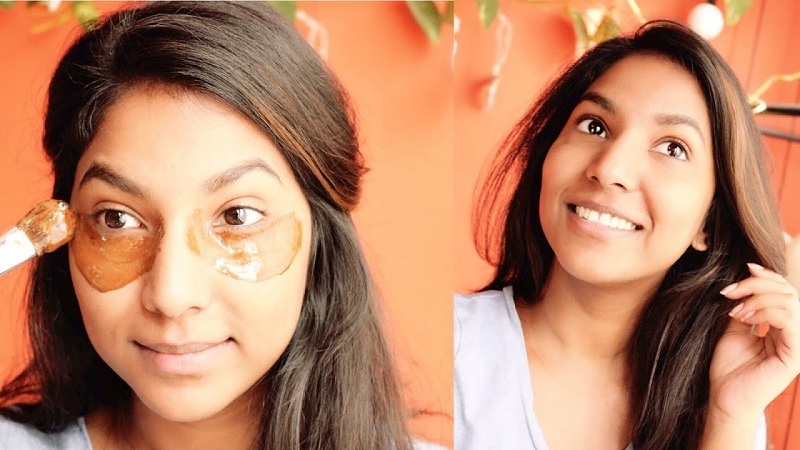 How Can Honey Remove Dark Circles Under Eyes?